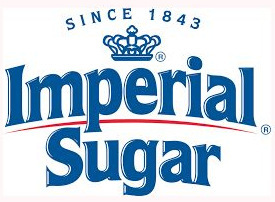 This post written by me on behalf of Imperial Sugar, a sponsor of #AppleWeek. Phew! What a week! 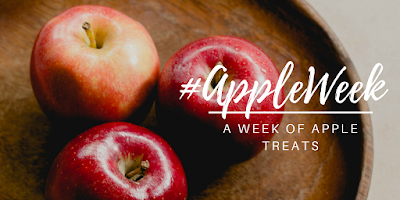 So many apples creations from the #AppleWeek crew. And many, many thanks to Carlee of Cooking with Carlee for organizing this fantastic event. 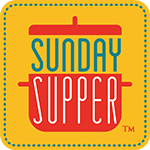 In case you are just finding this now, I posted several recipes through the event: Seared Steak with Envy-able Apples, Grilled Cheddar Cheese with Apples and Hatch Chile Hot Sauce, Baked Chai-Spiced Apple Chips, Apple Butter-Glazed Chicken Wings, Bulgogi-Inspired Oven Beef Jerky, and Gingered Apple Triffles. So much delicious fun. This is one of those desserts that looks impressive while not being that difficult to create. I will admit that my rosettes aren't picture perfect, but they get the idea across...and they are tasty. Mix the flour, ground almonds, powdered sugar, and salt together; rub in the butter until the mixture resembles coarse breadcrumbs. Alternatively stir in water and vodka, if using, until the mixture forms a ball. Roll out between two pieces of parchment paper. Press gently into a tart pan. Prick crust with a fork to prevent bubbling. Bake for 20 minutes at 350, or until a light golden brown. In the meantime, make the frangipane. Mix everything together to form a paste. Once the tart crust is cooked, spread a layer of frangipane over the bottom. Bake for 20 minutes. While the frangipane is baking, prepare your rosettes. 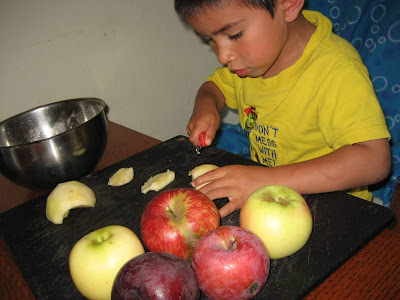 Thinly slice the apples with a mandolin slicer. Lay the slices in a row and roll them to form rosettes. Press the apple flowers into the partially baked frangipane. Repeat until the pan is full. Drizzle with honey and return to the oven for 30 to 35 minutes. Let cool for 15 to 20 minutes before removing the tart from the mold. Remove tart from the pan. Sprinkle with some sugar for "sparkle", if you like. Slice and serve. It's soup season! And the weather definitely took a turn towards the chilly side as soon as September 21st arrived. Funny how that works. Just yesterday I went to work with a scarf and boots! Okay, no comment on the lack of make-up, please. Moisturizer with sunscreen is about all that I manage most days. This is just to show you that Fall has hit on the central coast of California. I already made a Pretty Simple Greek Salad. Hopefully I'll have time this week to try the Creamy Vegan Potato Chowder (pg. 180) and Cherry Almond Breakfast Cereal (pg. 22). We'll see. D: Mom, I am going to offer you a sandwich critique. C: I didn't make any sandwiches. D: No, I am going to give you a critique sandwiched between two compliments. Okay? Ready? So, he liked the variety of beans I used (compliment). He thought it needed more corn kernels (critique). And he liked all of the toppings I offered (compliment). That's not too bad. So, my version isn't as quick and easy as using canned beans, canned tomatoes, and frozen corn. But in the sense that the Overhisers are urging people to fall in love with real food, I think this version of the recipe fits the bill. 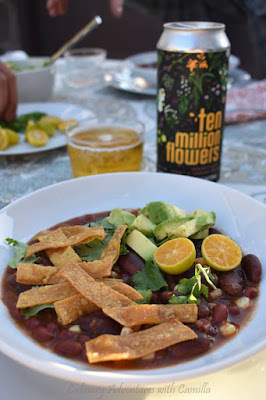 I loved that I got to use beans from Rancho Gordo, peppers from High Ground Organics, and tomatoes from Serendipity Farms...all local-to-me favorites. 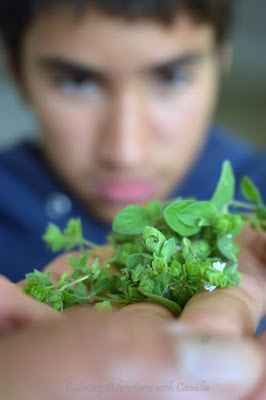 Best of all, though, the Enthusiastic Kitchen Elf plucked some fresh oregano from his garden for me. And I am so excited to make my own crispy tortilla strips. I know it's silly, but I've never done that before and it was a revelation. Preheat oven to 375 degrees F. Cut the tortillas in half, then slice into 1/2" wide strips. Place them in a mixing bowl. Toss to coat with olive oil and turn out onto a parchment or silicone mat-lined baking sheet. Spinkle with salt and bake for 10 to 12 minutes, until browned and crispy. Set aside. In a large souppot or Dutch oven, heat a splash of oil. Stir in the onions and peppers. Cook until the onions are softened and beginning to turn translucent, approximately 5 to 6 minutes. Stir in the garlic and stir to coat with oil. Season with cumin, paprika, and oregano. Add in tomatoes and cook until they have lost their shape, approximately 8 to 10 minutes. Add in the beans and corn kernels. Pour in the broth and bring to a boil. Reduce heat to a simmer and cook for 20 to 30 minutes - until the broth has thickened slightly. To serve, ladle soup into individual bowls. garnish with crisped tortilla strips, cubes of avocado, fresh cilantro, and a slice or two of lime or calamansi. 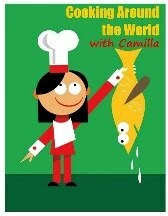 I'm not sure I'll get to the other #PrettySimpleCooking club picks for September. But I will jump back in with the October recipes soon. Oh, and for fun, I paired it with a Kölsch-style beer from local-to-me Discretion Brewing. Cheers! 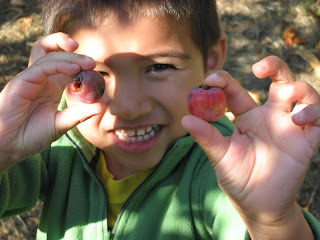 Yesterday my mom invited us to join her for apple picking at her friend's property. 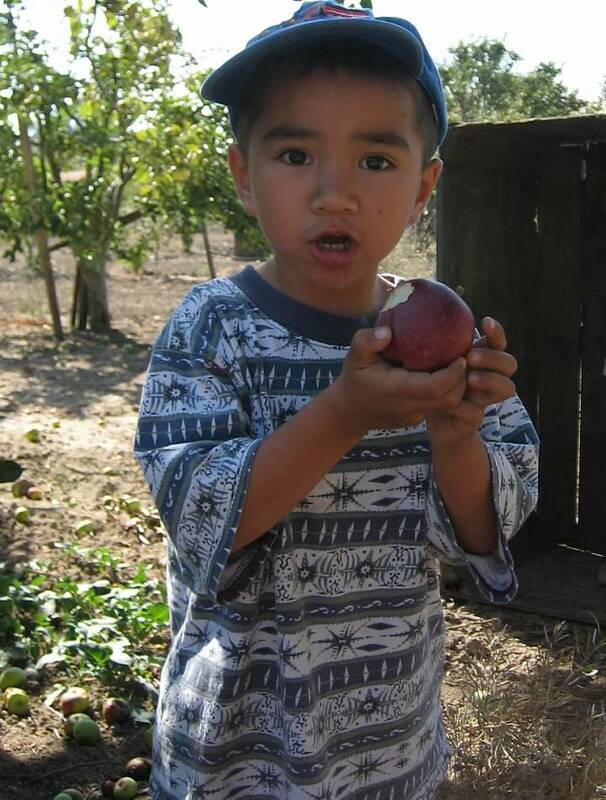 Apple picking has been a Fall tradition since the boys were little. 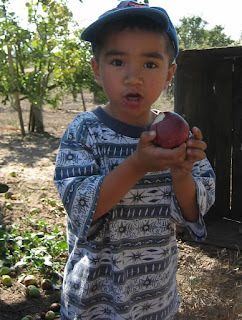 I'm thinking those apples in his hands might be about the same size...just twelve years' difference. So, this year, one of my best friends and her two boys joined us. And we're looking forward to sharing an apple pie with them this weekend. They worked hard for those fruits. Do you have a family tradition of going apple picking this season? What's your favorite apple recipe? prizes were donated for the giveaway, and this page may contain affiliate links. What a week it has been! I hope you're enjoying the bushel of apple recipes that the #AppleWeek crew has going. And many, many thanks to Carlee of Cooking with Carlee for organizing this fantastic event. Please be sure to check out my introduction post and enter the giveaway. This recipe, and variations of it, have long been a family favorite. Years ago I adapted from a traditional Norwegian recipe for an apple triffle, Tilslørte Bondepiker. For this post, I am featuring some of the sponsor products and ingredients from Nairn's, Rodelle Vanilla, and Swiss Diamond. * While I did use a mandolin slicer for the apples, I peeled them with my new Swiss Diamond paring knife...and it quickly replaced my previous paring knife in my knife block. Love it! In medium skillet, combine sliced apples, sugar, water, vanilla extract, ground ginger, ground cardamom, and ground cinnamon. Cover and cook till the apples are very soft. Crumble 4 of the cookies into coarse crumbs. And whip the cream until soft peaks form. To assemble: Place 1 to 2 T apple compote in the bottom of an individual serving dish or glass. Add 1 to 2 T whipped cream. Add 1 t cookie crumbles. Repeat layers until the dish is full. Garnish with a whole oat graham. Serve immediately. Pecan pie is a family favorite; in fact, my Enthusiastic Kitchen Elf makes a version all by himself. 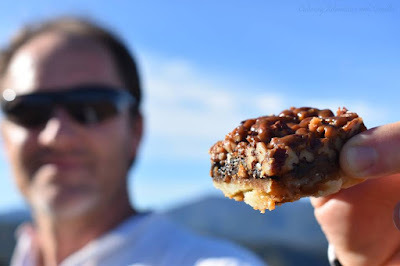 His Espresso Browned-Butter Pecan Pie is amazing. 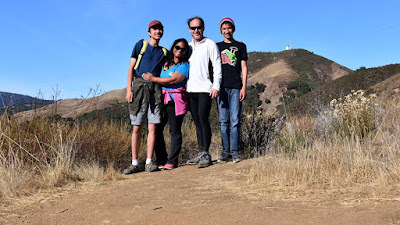 So, when we were planning a grueling, albeit short, hike last weekend, Jake asked what treats I was going to pack. I decided to make some pecan pie bars. The bars were a hit up there...on top of the ridge! And it's a good thing I packed more than one per person! Somehow, though, I still didn't get to eat one. I'm not sure who ate three bars, but I can guess. Preheat oven to 350 F. Place flour, powdered sugar, and salt into a mixing bowl. Rub in butter till the mixture resembles coarse breadcrumbs. Stir in water until the mixture forms a ball. Press the dough into a 9"x13" baking pan and bake for 20 minutes until golden brown. In the meantime, make the topping. Melt the butter, honey, and sugar in a small saucepan. Bring to a boil and, without stirring, cook for 2 minutes. Remove from heat, stir in the cream and pecans. Raise oven temperature to 375 degrees F. Spread chocolate over the crust, pour the topping over the melted chocolate, and bake for another 25 minutes. Let cool completely. Cut into squares with a sharp knife dipped into very hot water.